I'm obsessed with dying my hair black, but at the very moment it starts to fade I get antsy about wanting to dye it again. There's something about the intensity of the color that I'm addicted to. However, because of my addiction I've been finding that I tend to dye it more often than recommended. My poor strands! Problem solved... 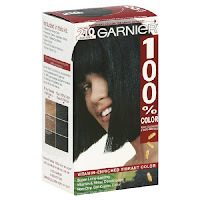 I discovered Garnier 100% Color, $7.99, that lasts much longer than other dyes I've used in the past (even salon visits) and because it's loaded with vitamins B3, B6, and micro-minerals it's also super nourishing. Don't worry about breaking the bank on salon visits when you can do it yourself and put the extra cash towards a new pair of stilettos.